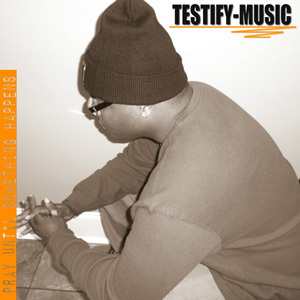 Testify: "Pray Until Something Happens"
Testify is a reborn Christian rapper out of Prattville, Alabama whose second album Pray Until Something Happens continues to spread the word of God through Hip-Hop. Troubled earlier in life, Testify (Michael Anthony Warren II) turned his life around by using his musical talents to explore his own spirituality. I had lost all hope until some friends took me in, and brought me to a Man to take away my sin. Testify initially tried to use his music to reach mainstream stardom. But after failing to reach personal glory through that means he focused his efforts on glorifying God, which has led to a whole different level of success—an internal fulfillment not possible without the faith he lacked earlier in life. Pray Until Something Happens isn't merely a Christian rap album. Testify's production, rhymes, and flow hold their own with his secular peers. His grooves channel vibes of late 80s and early 90s R&B and Rap: fat bass lines not unlike Gangsta Rap's samples of 70s funk, with high-pitched synth melodies flying over the top. Not entrenched in a retro vibe, however, hints of Kanye's "Stronger" vocal-synth sound jumps into the mix in "#thePower." Lyrically, there's no denying the Christian nature of the album. Testify puts God first from start to finish. But his message goes deeper, exploring real world issues that listeners of any faith (or none at all) can relate to. From "Self Defeat" to "Attitude Adjustment," Testify's songs address universal challenges faced by us all.